See the three new videos in my section called Battleground Tours. On Oct 11. 2018, I was the moderator for a lecture and round table discussion entitled “Nazi Prizoners in America.” The original speaker, Dr. Arnold Krammer, Emeritus History Professor from Texas A&M, due to unforseen circumstances was replaced at the last minute by three local speakers. Dean Simmons, Jerry Yocum, and Tom Lalim have all written about POWs in the Upper Midwest and did a great job filling in. A slide show of original photographs from Dr. Krammer’s collection was also shown. 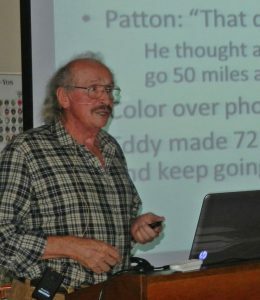 The reason I volunteered for this lecture is my personal experiences as a 7 year old boy, witnessing the hundreds of German POWs in Milltown, WI, who worked at the Stokely Pea Cannery there. 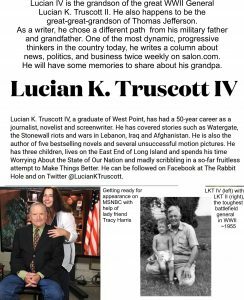 I also invited the great general’s grandson Lucian K. Truscott IV, who will take part in the Student Outreach Q & A session starting at 6 PM. Main lecture at 7 PM is by biographer Harvey Ferguson. Public welcome, $5 donation appreciated, students are free. 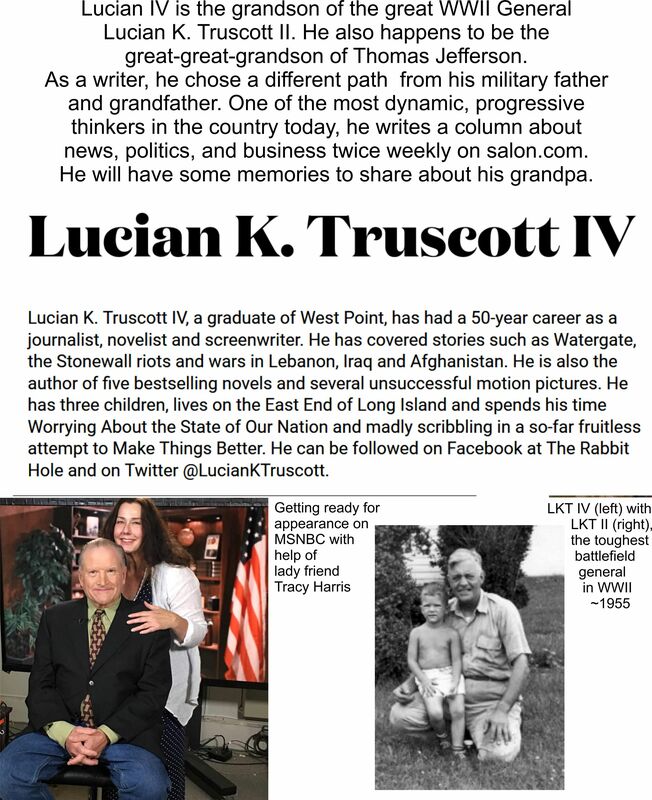 Lucian IV is a New York-based journalist, novelist, screenwriter, West Point graduate. Click on the image below for a larger view. The first meeting of the 31st year of the Harold C. Deutsch World War II History Round Table, the longest-running WWII discussion group in the nation, was held on Sept.14, 2017 at 1930 at Fort Snelling, Minnesota, and I was privileged to attend. The Director throughout these years, Col. (US Army, ret’d) Donald G. Patton invited me to serve on the Resource Board of the group, and introduced me to all the board members attending the lunch at the Richfield VFW. I was very impressed with the quality of the board members, many of them authors and historians, and we had a lot in common. 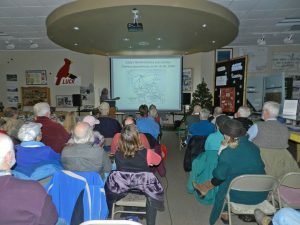 What is most impressive is the enthusiasm of the die-hard audiences at these lectures. The auditorium holds about 300 people and it started at fill up a half hour before the lecture began. The round table discussion after the lecture with WWII veterans I found very moving. These 90 plus year-old soldiers, sailors, and pilots have seen so much in their lives, and are still able to convey their experiences, sometimes just through their modesty and the power of understatement. Though the session ran a bit long, maybe 2 hours all together, I didn’t see any of the audience get up and leave. It’s all open to the public, generally on the 2nd Thursday each month Sept thru May. Check their website http://www.mn-ww2roundtable.org/. The public is welcome, admission is a donation of $5. Don Patton is the glue that holds it all together and he knocks himself out to make everyone feel welcome and included. I hope I can contribute something to the discussion and to the organization during the coming year. In the Summer edition of “Through the Arch,” the proud magazine of my Alma Mater, Class of 1955, the following article appeared on page 51 about my new book Patton: The Madness behind the Genius. I have always been eternally grateful to Shattuck for the education I received there, made possible by a scholarship from anonymous alumnus or alumni. I really did learn the elements of grammar and composition there, especially from two very stern taskmasters, “Nails” McNally and “Buzzy” Below — still among my heroes today. We are running a 1/6 page advertisement for our book Patton: The Madness behind the Genius in the August, 2017 and in subsequent editions of the national magazine WWII History. This book has been received enthusiastically here in Wisconsin, but now we need to reach out to the tens of thousands of WWII history buffs nationwide so as to help disseminate our unique viewpoint on the controversial life and character of the great general. Why was this photo a clue to the mystery? Several hundred crew men fired shells more than 40 mi. at Mach 3. The authors, a married couple residing in Luck, WI, traveled to Nancy, France in Feb., 2016 to help solve a mystery. 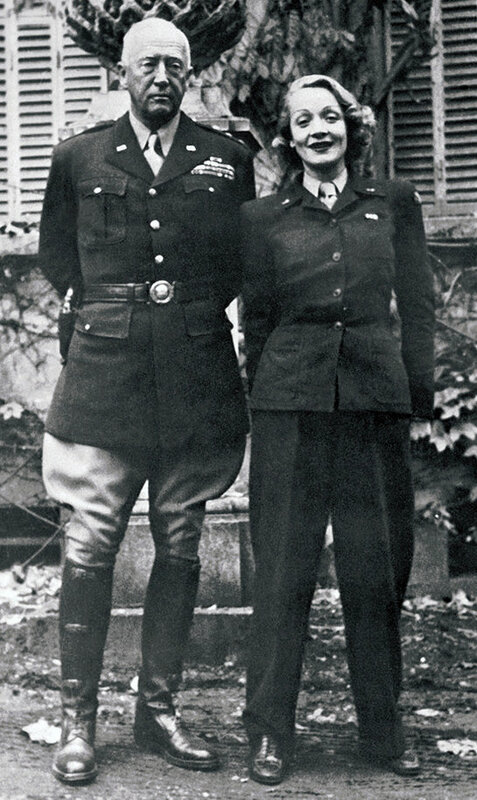 What became of the residence of Gen. George S. Patton, Jr. and the Third Army command post (CP) they had used for nine weeks towards the end of 1944? We could find no person who possessed this information, and no book or other record that listed it. A certain government building was our lead candidate, but the present occupants knew nothing about its history, and ignored our requests to visit until the day we arrived in Nancy. One thing we knew from Patton’s diary was that his house had been bombarded in the early hours of Oct. 24 by a 280 mm German Railway Gun. The 560 pound high-explosive shell missed his residence by only 35 yards but blew out most of his windows as it almost completely destroyed a smaller house across the street, wounding two. We will show our video tour of Nancy as Gillian photographed that house and other buildings that were hit that night. Next we drove some 50 miles northeast, almost to Germany, to inspect a tunnel where the Nancy Gun may have been fired from. We knew that the big guns hid in railroad tunnels during the daytime to avoid destruction by the Air Corps’ ever-present P-47 fighter-bombers. Using Air Corps after-action reports and a trip to the National Archives in MD, we put the whole story together about how the Allies discovered the correct tunnel and knocked out the Nancy Gun by skip-bombing on Oct. 28. A 15 page article with all the details by Jim and French super-sleuth Jerome Leclerc will appear May 15, 2017 in a British military magazine called After the Battle. As a result of our research, a plaque commemorating Patton’s CP will soon be placed on the building whose storied past we revealed. On Friday, Mar 10, come to the Luck Museum between 5:00 and 6:30 PM for the first-ever bull session and coffee klatch with Luck author Jim Sudmeier. Sudmeier, who gave a talk at the museum on Dec. 7 about his new biography “Patton: The Madness behind the Genius” will also be happy to sign books. On Feb. 1 the first books became available on Amazon worldwide both in paperback for $17.95 and Kindle for $9.99. The museum has a supply of the books on hand which you can buy any time now, saving $1 of state sales tax – at the same time donating $5 of the proceeds to benefit the museum. Sudmeier shows how the great American icon General Patton is diagnosed with Narcissistic Personality Disorder (NPD) and how it explains his enigmatic behavior both on and off the battlefield. NPD is most damaging to those who in contact with the NPD sufferer, an adult-toddler who inevitably leaves a trail of destruction. The book is a must-read for WWII buffs and anyone who attempts to understand the behavior of President Trump (Aylford, Henry. Vanity Fair, Nov. 11, 2015) as well as General Patton. behind the Genius in front of the Luck Area Historical Society in Luck, WI. The meeting will be held at it usual place on the museum side of the Luck Library and Museum, 301 Main Street. Advance publicity has gone out on the Society’s Facebook page “Luck WI Area Historical Society,”on the front page of the Enterprise Press and the Inter-County Leader, News Section A (both on Nov. 23), and again on page 3 of the County Ledger Press on Dec. 1. 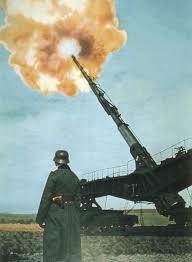 Current Research on the Shelling of Patton’s Nancy HQ. 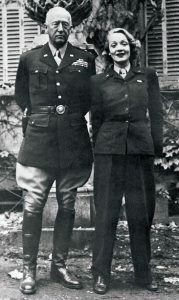 Can you imagine that the location of the residence of General Patton in Nancy, France where he lived for nine weeks (Oct. 11 through Dec. 19, 1944) could have been forgotten—lost to history? The same building that was almost destroyed one night by a German 280mm railway gun firing from over 30 miles away? Well, that’s exactly what I discovered when I was writing my biography of the great general. I checked with French WWII expert Jerome Leclerc. We had worked together on a different military research project some 12 years earlier. Jerome lives in Nancy and works for the Departmental Archives. When we discovered the address of the former chateau, even the current residents were astonished to learn its history. After a fact-finding trip to France this February, one to the National Archives II, and another to the Patton Museum in Fort Knox, TN, we are nearly finished with an article for the British military magazine After the Battle. “The Shelling of Patton’s Nancy HQ” by Jim Sudmeier and Jerome Leclerc will appear in the 2017 May issue. As a result of this research, a plaque will be placed on the building in the near future. After the article appears, I will be free to tell more about the improbable tale of how this mystery unfolded, with a video record of our travels around France doing the research.